jQuery Datatables when initialized on the HTML table it has automatically make certain valuable feature like data pagination, table column sorting, search all table column data from single textbox, display number of records per page functionality without writing of any line of code or script. So, here we have to discuss how can we remove default DataTables search textbox and make custom serach of filter DataTables data using PHP script with Ajax. Because Default Search box is used for search records of all table column and display on Datatables. But in Web Development, Sometimes we want to required custom search filter for get specific column search onlu not whole table column search. 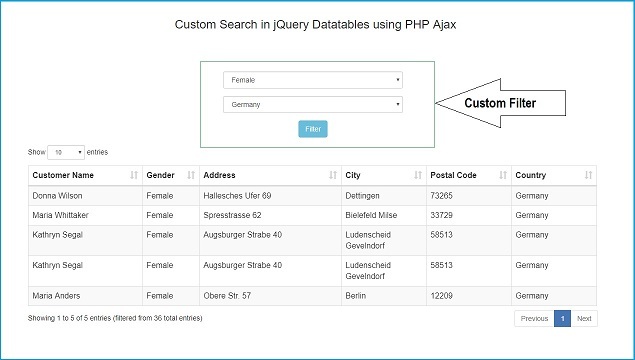 For this in this tutorial, We will learn how can we implement custom search filter into jQuery DataTables by using Ajax with PHP script. jQuery Datatables Customer Search filter with Server side processing help us to get records based on our choices of data filter. For example from the list of data we want to just filter "Male" gender data only. So we have search search in textbox then it will return female data also. For this we have to required custom search filter in Datatables for increase efficiency of exact search of data. We can implement custom search by using HTML Select box or even textbox also for filter jQuery Datatables data. WHERE Gender = "'.$_POST['filter_gender'].'" AND Country = "'.$_POST['filter_country'].'" How to do it at laravel? How to add the search box that we can search columns like the rest of your example ? I need to have select drop down and the search input box within the same app. I love your tutorial very much, it helps me to learn coding with php and mysql . recently i found a very interesting plug for datatables. it calls YADCF(yet another datatable column filter) http://yadcf-showcase.appspot.com/, could you please make a tutorial for this plug,how to achive it in php server side with advanced filter? such as select2? Appreciated for your great job. same question can we add search box to it please? and can we make this fetch file generic example, just pass the table and columns to retrieve to make it reusable using class/oops, please? can i ask for the code (CI)?? ?